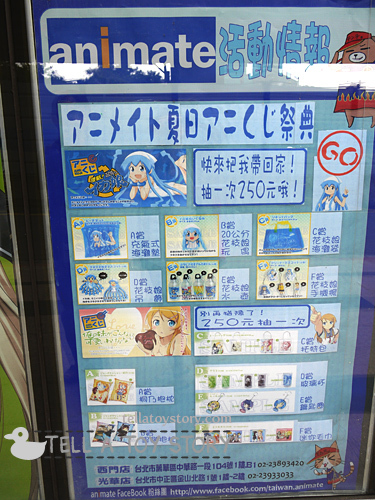 New items promotion outside Animate shop in Sept 2011. 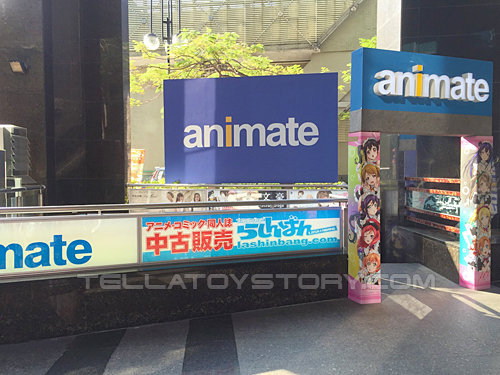 Animate (安利美特) is a Japanese chain specialising in anime-related goods with a flagship store in Taipei. 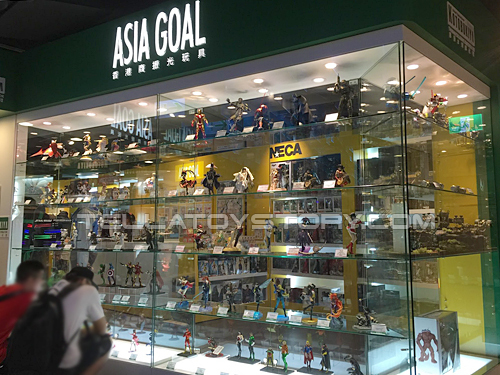 Here, you will find no lack of mandarin-translated manga, by Taiwanese publisher Tong-Li (東立), and an assortment of pencil boards, folders, posters, scrolls, T-shirts, keychains, mugs and figurines as well. If you accumulate NT$3000 in receipts within a year, you can join their free membership for discounted prices on most items. You will need to sign up before the first receipt is issued to qualify. 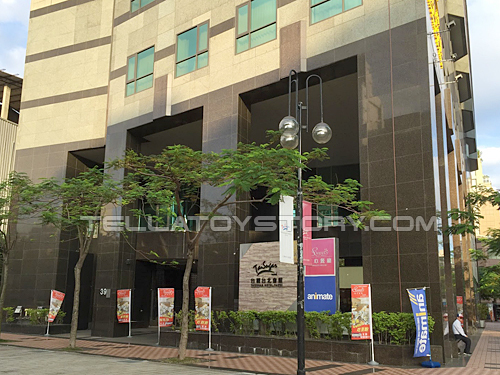 The outlet at Ximen occupies a large basement under the Tai Sugar Hotel. Don’t forget to check out the bargain bin and you may find a gem or two at clearance prices! 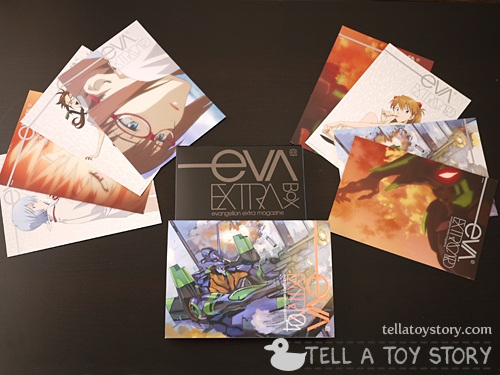 I found this Evangelion Extra Box with full-colour mini magazine and picture cards in the bargain bin for only NT$100! 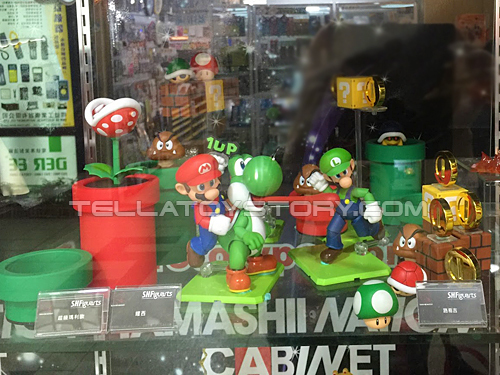 As these are licensed for sale in Taiwan only, they are authentic goods at lower prices than the equivalent you will find in Japan. The wonderful thing about locally-licensed goods in Taiwan is that the prices are already printed on the product so you do not have to worry about being overcharged. You can find original game prizes from Japan too. An example of a price tag. The number in the box is the price, in the case, NT199. This is the entrance facing Tai Sugar Hotel. SanSun (33学堂) is a chain of stationery stores but also carries a large assortment of anime-related goods such as keychains, pencil boards, folders and T-shirts. 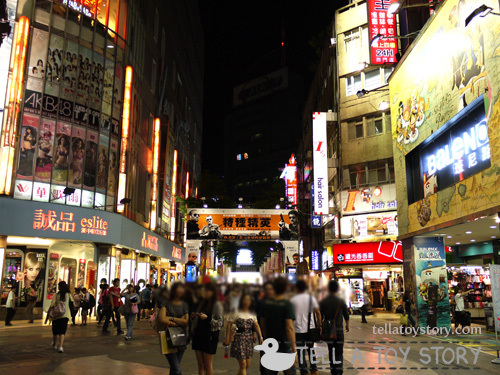 The outlet in Ximending has 4 floors of shopping goodness. 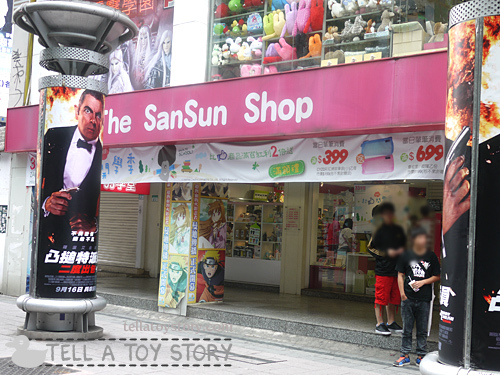 When we visited Sansun in 2011 (Sep) and 2012 (Jul), they were having a 10% discount for anime goods. 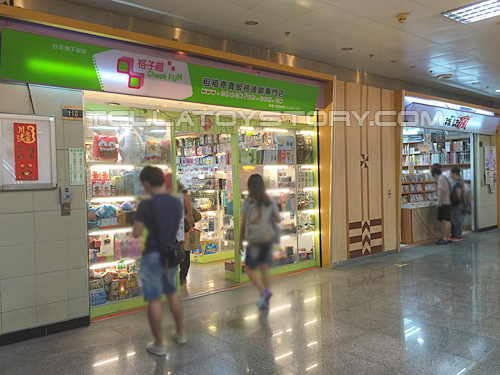 Featured Outlet: Ximen 西門 For other outlets, refer to their website. 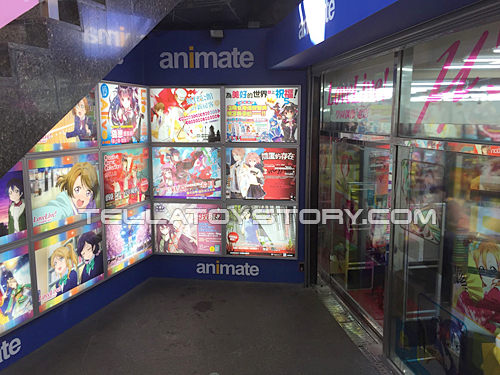 Both Animate and SanSun stock anime “fukubukuro” or “lucky bags”. It’s basically a paper bag full of random items from a particular anime and sold at a price much lesser than the total cost of all the individual items. 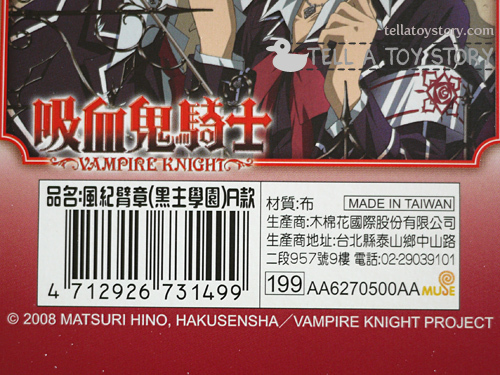 It’s marked outside which anime the items belong to but you can’t see what the individual items are. It’s really fun and worth the price especially if you do not have any items from that anime to begin with. We bought one bag each from Animate and Sansun. 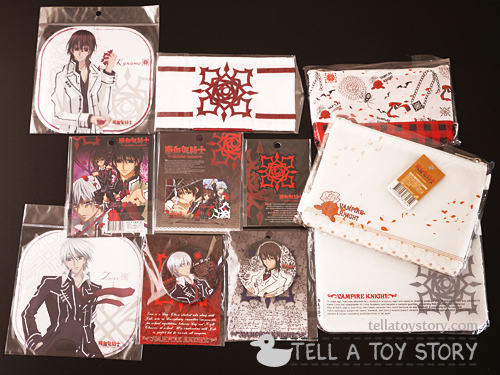 Here’s a look at the contents of the Vampire Knight fukubukuro lucky bag. There are mouse pads, picture cards, cloth pouches, emblems, armband and buttons. If you were to buy all these individually, the total cost based on the printed tag price is NT1265. 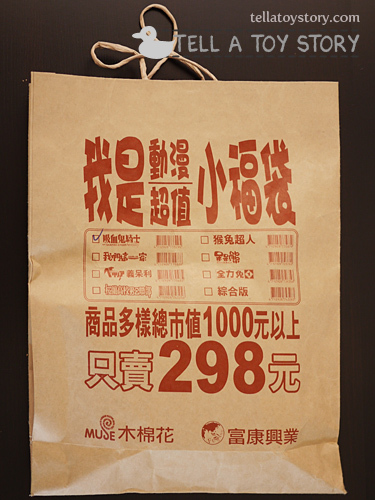 Since a lucky bag only cost NT298 each, that’s more than 70% off! 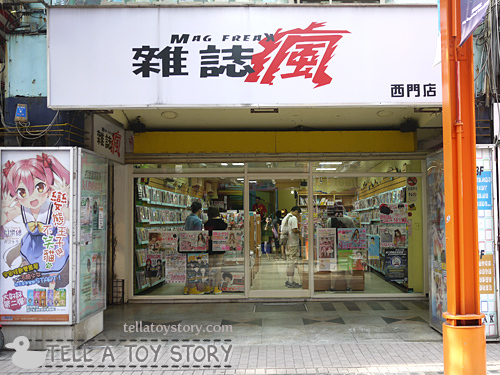 Mag Freak (雜誌瘋) is another popular anime chain store and this particular outlet occupies 3 floors. You can find many Japan imported magazines as well as locally translated character books. 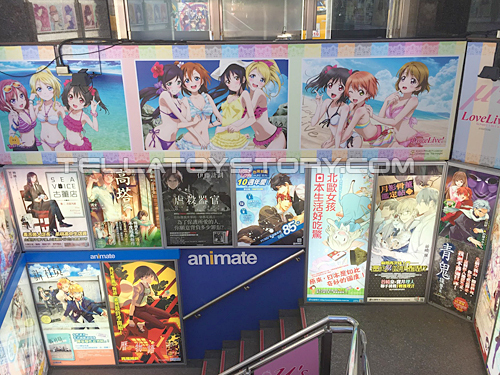 They also carry mangas, posters and anime goods. I found some older Figmas at discounted prices here. Figmas tend to appreciate in value after a while so I was glad to get hold of two that were close to their just-released prices. Featured Outlet: Ximen. For other outlets, refer to their website. 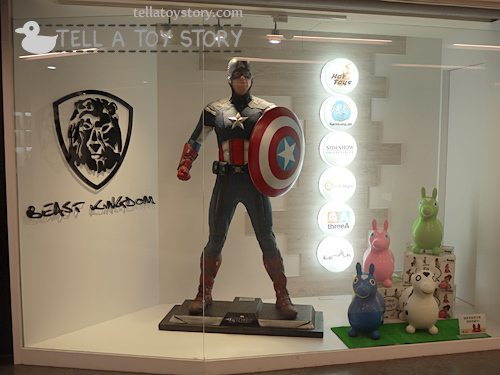 If you are into Hot Toys, a Hong Kong produced of a line of realistic Hollywood movie figures, you will be glad to know that there is an official distributor in Taiwan: Beast Kingdom 野獸國 and their showroom is in Eslite Ximen. The window display used to be on the first floor (2011) facing the street but they have since moved to a larger basement store with an equally impressive gallery (2012). You are welcome to snap photos of all the exhibits. Definitely worth a visit even if just to admire the gallery. Items display on the right are for sale. 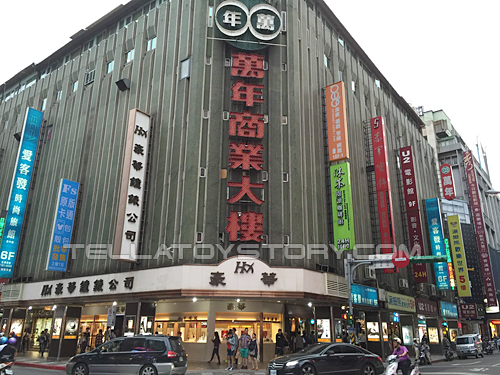 The 4 floor of this building in Ximending has lots of hobby kits, Japanese toys such as Figma & Nendoroid and licensed plushies such as Shin-chan! Prices are all tagged so you don’t have to worry about different prices for tourists. The front of the building is quite prominent. It’s at an intersection just off Ximending central. 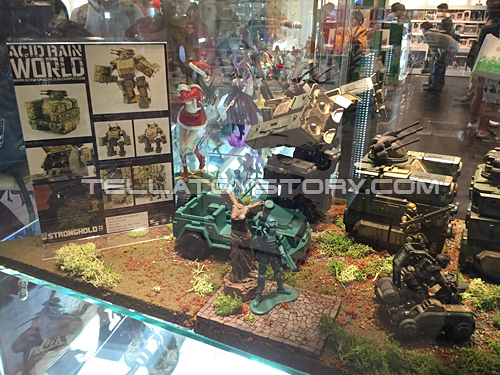 Lots of displays at each of the shops. 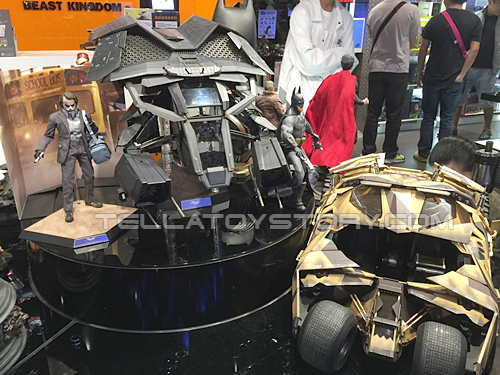 There’s also Hot Toys, Play Arts Kai, SH Figuarts & Gunpla. Found several new stocks of Crayon Shin Chan at this store, so far at the lowest prices in Taipei! 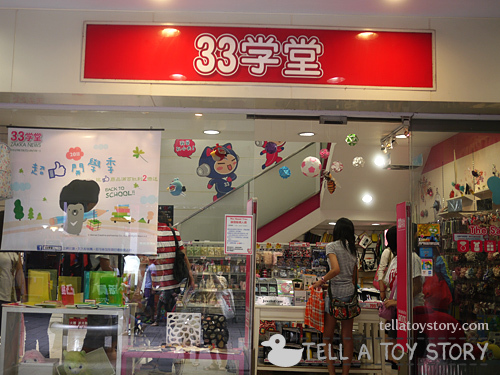 4th floor, shop number 33 near the escalator. Opens 2.30pm to 9.30pm daily. This corner shop on the 3rd floor also has good prices but do price check before you buy. 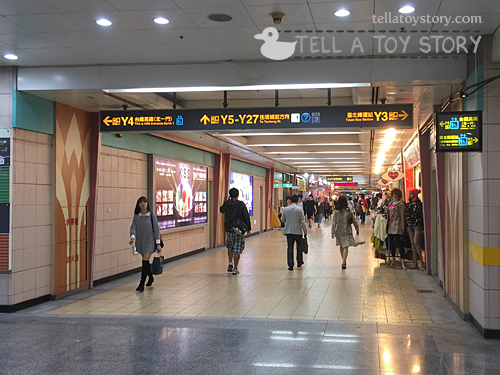 No visit to Taipei is complete without visiting Y-Mall at Taipei Main Station. 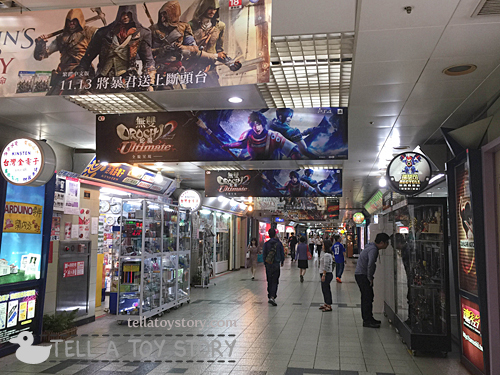 It is an underground mall stretching for around 2km with numerous shops selling apparel, handphone accessories and toys. 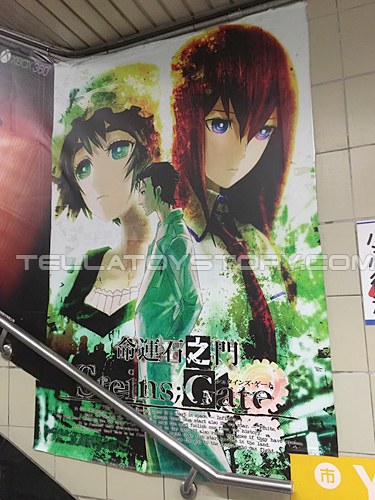 Look out for the Y Zone, it’s one level below the station exit towards the direction of Q Square. It’s the same level as the basement food court in Q Square. 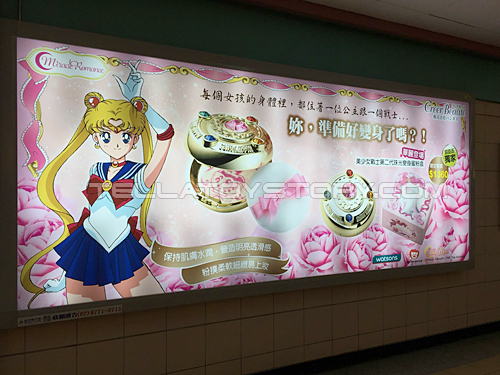 Pretty anime advertisements fill the walls of the passageway as you make your way to the many stores. One of the stores I like to patronize is Check Fun. There are many outlets throughout the city. 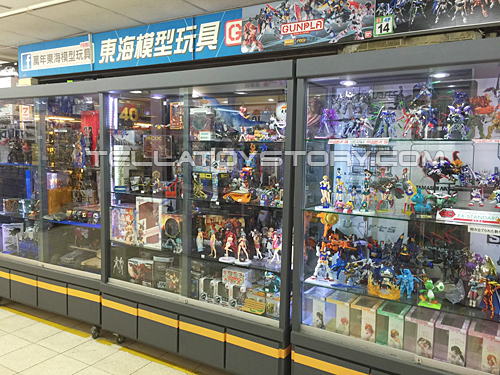 Although it resembles our Toy Outpost, there is much more variety and I do not think that the cabinets belong to different sellers. 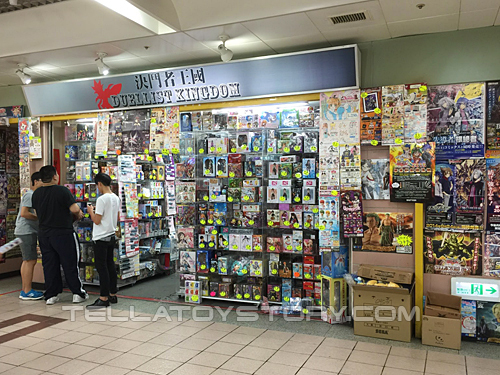 One of the many examples of shops carrying anime-related goods. 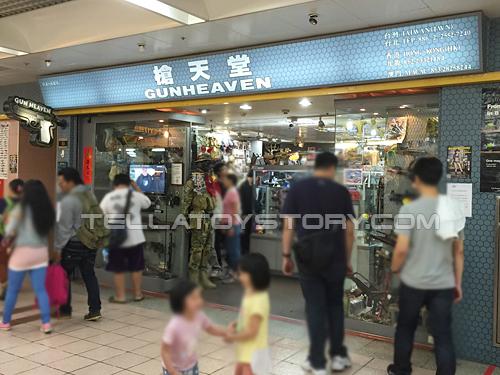 There is even a shop selling realistic replica toy guns. 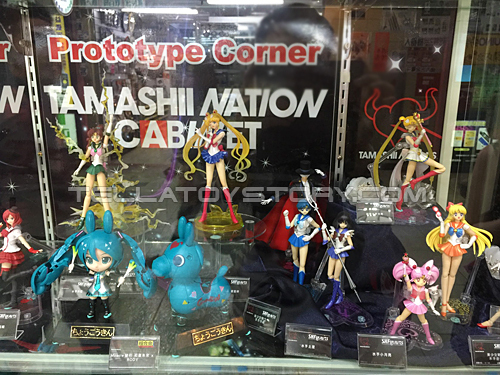 Located at one of the stores is the official Prototype Corner, featuring SH Figuarts Sailormoon and Hatsune Miku x Rody. 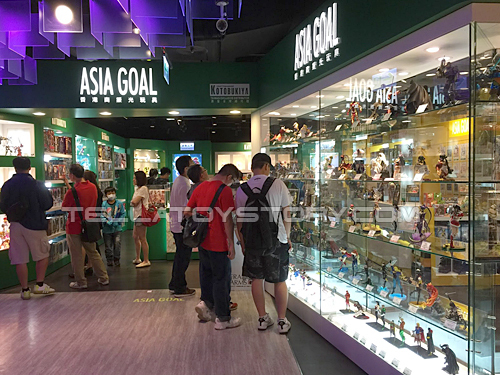 There are more than 20 gaming shops and toy shops, so allocate about an hour or two to browse while you are here. Lots of Figma, Nendoroid and even SDCC NECA figures are available. 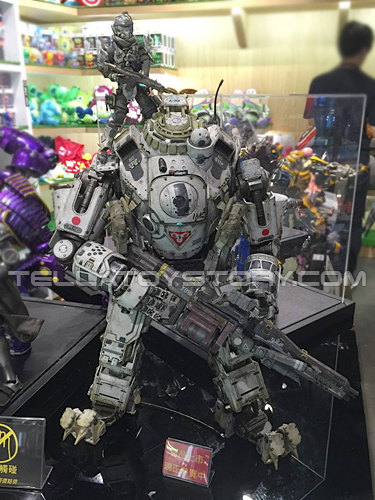 A note of caution, do compare prices between the shops and verify the authenticity of the toys you are purchasing. I have seen bootleg Figmas & Nendoroids in some shops. The chain I like to visit is called “Recycle”. They usually have some older items on sale. I bought an original Bandai S.H.MonsterArts Big Chap Alien at a very reasonable NT$799 (SGD$35). 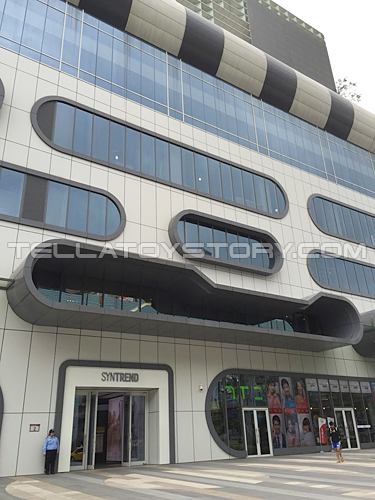 Syntrend Creative Park, or simply “Syntrend”, is the latest and greatest IT mall in Taipei! Floors 1 to 5 cover your usual IT gadgets and gaming peripherals. 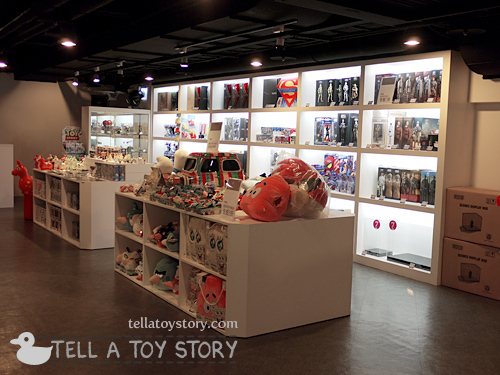 On the 6th floor, you will find an entire floor dedicated to toys! Figma, Nendoroid, SH Figurarts, Gunpla, nanoblocks, DC, Marvel, PlayArts, NECA, Tamiya, Hot Toys, Sideshow, ThreeA, Kids Logic, Bandai Chibi-arts can all be found there! 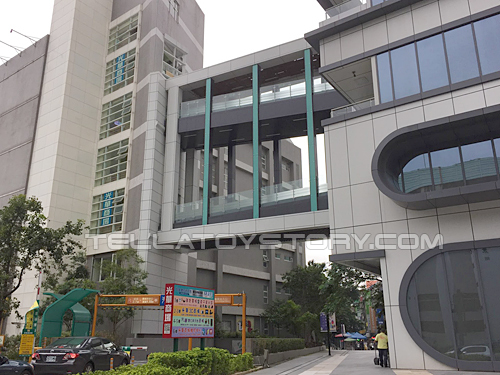 It has a bridge to Guanghua Digital Plaza, the older IT mall. 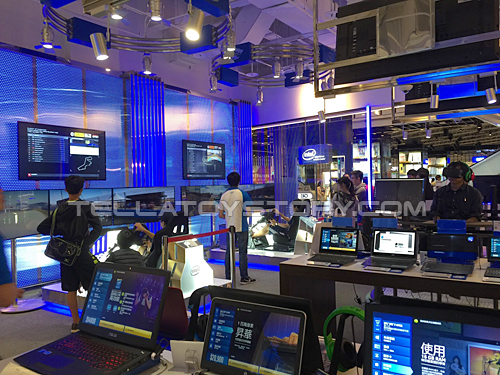 An Intel showroom demos the latest gaming technology including driving simulators using wrap around displays. The Oculus Rift is also available for you to try. 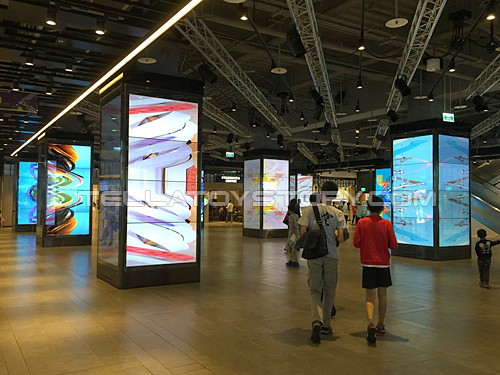 The lower floors showcase mostly lifestyle products, PC and mobile accessories. 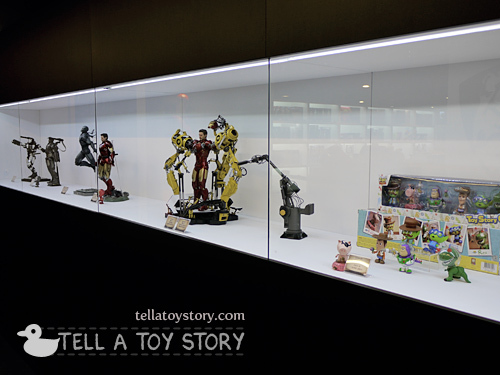 The real action starts on the 6th floor which is entirely dedicated to toys! 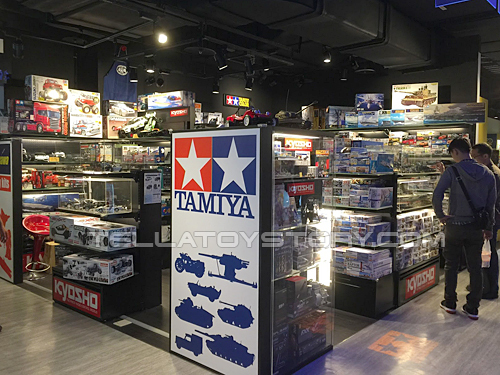 Tamiya store for the hobby kit enthusiast. 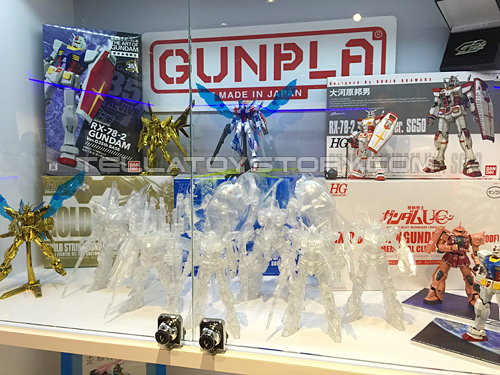 Everyone’s favourite Gunpla at Gundam Base. 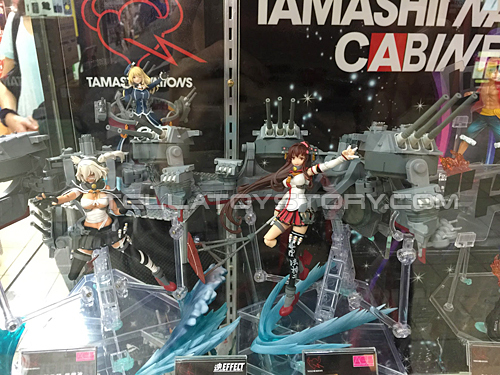 There are plenty of display cases for you to admire the finished models. Photography is welcome but as usual, no touching! 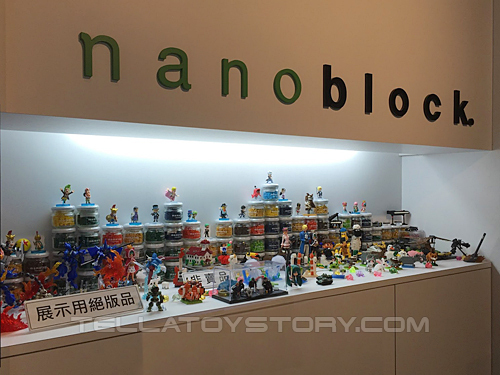 The ever popular nanoblocks are available at Syntrend as well, along with Taiwan exclusive models. 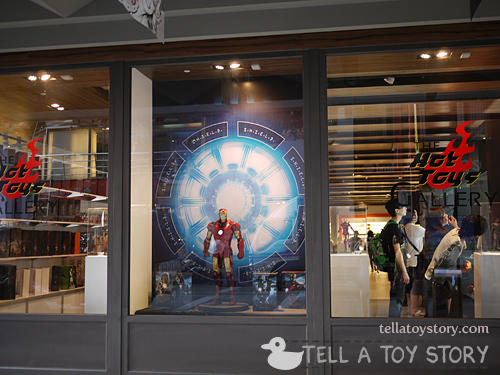 Hobby toy is an authorized agent for Hot Toys, Play Imaginative, Side Show Collectibles and COSMI, which has interesting designs for Disney as well as Marvel products. 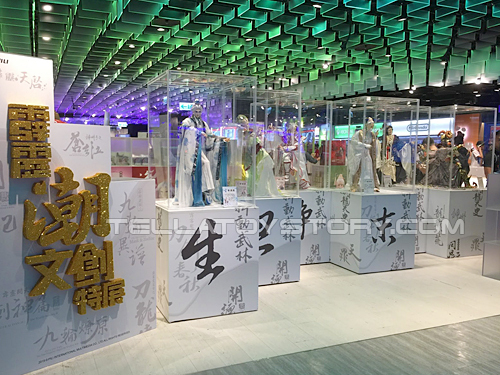 There was an exhibition at the atrium on Pili, the puppet-based martial arts drama that is surprisingly popular with people from all ages, when we visited the mall in Nov 2015. I enjoy the show too as the choreography and visual effects are a treat to watch. It has its own cable TV channel so you can try to catch it at your hotel room and new episodes are broadcast nightly. Short clips can be found on the official YouTube channel. The puppets are huge works of art with elaborate costumes and lively facial expressions. 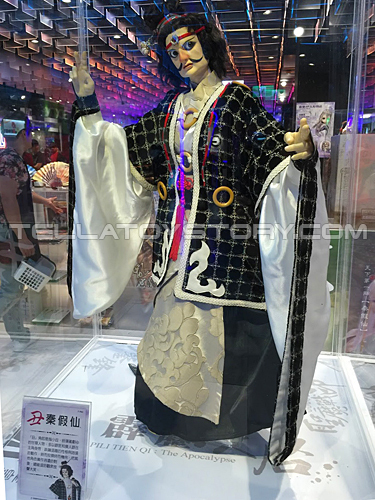 The life-size replicas of the puppets used for the show were on display and ranged from 80 to 90 cm tall! 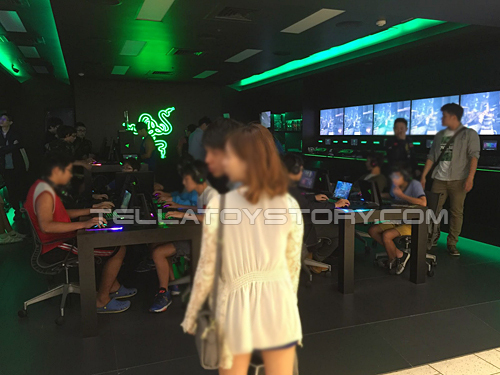 A Razer gaming centre at one end of the floor seems popular with the local youths. 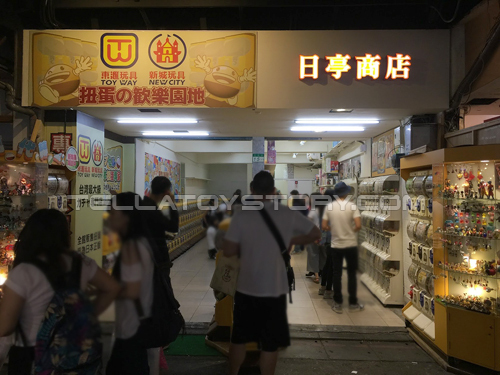 For those looking for gashapons (扭蛋) or candy toys, I highly recommend 日亭商店 which is selling licensed and authentic ones. 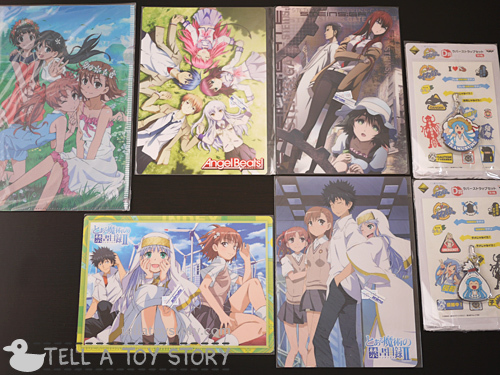 Try you luck at individual gacha or purchase a complete set, both at very reasonable prices. I bought a Rilakkuma mobile phone strap set of 5 characters at a total price (NT$300) which was less than the combined individual marked price in yen (200yen x 5 = 1000 yen = NT$383). Always check that the set comes with the accompanying character paper slips to ensure that you are getting the authentic version as there are other stores selling bootleg items. 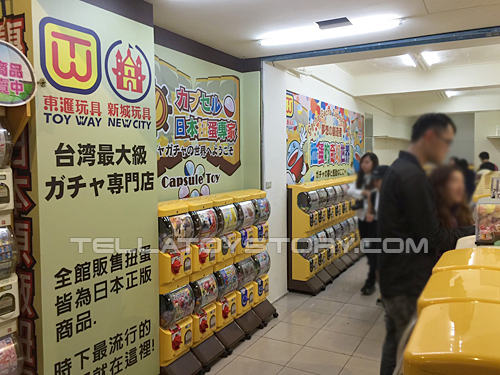 [Update Nov 2015] The store has since moved to a different street occupying a space that is twice as spacious and features literally 100s of gashapon machines! 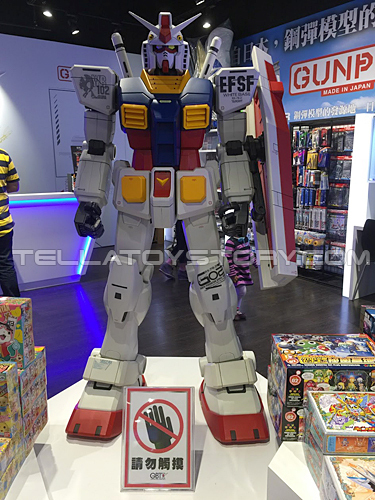 :D The store proudly proclaims that all goods are authentic and licensed from Japan. Another gacha shop that you can try is this, aptly named “Every dog has his day”. 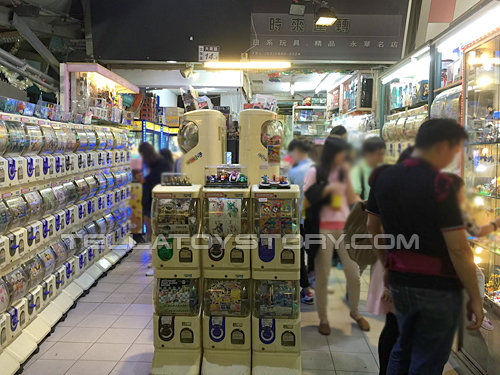 Lots of gashapon machines and complete sets can be found here too. 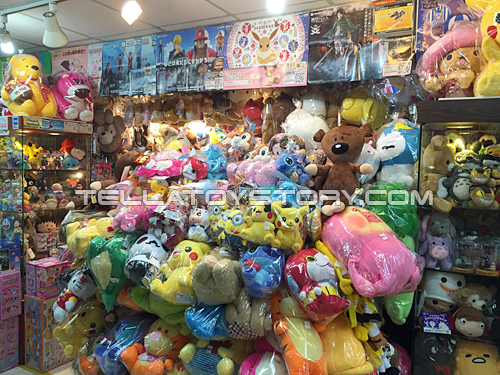 If you have visited the plushie stores in Wan Nian and still couldn’t find what you want, you can try this shop near the entrance of Shilin Night Market. 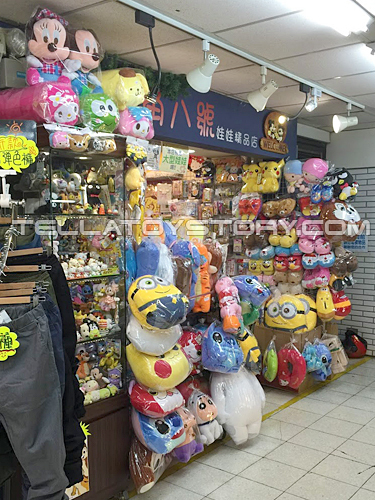 The plush toys are authentic and Crayon Shin Chan (蜡笔小新) is usually available too. Prices are quite a bit higher than Wan Nian though but better than Ximending central. Here’s a street view of the shop in Google maps to help you locate it. 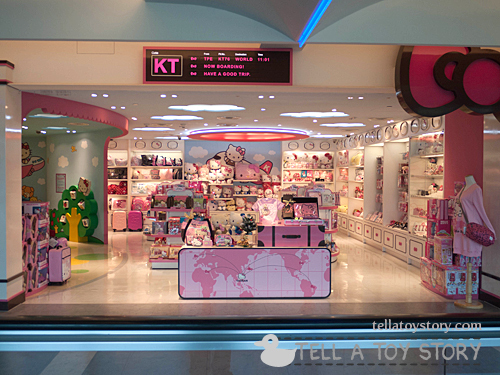 As you are leaving Taipei, do check out the Hello Kitty store at Taoyuan International Airport. 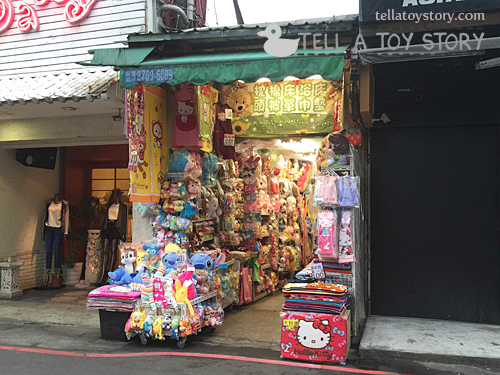 This store carries many exclusively licensed Hello Kitty Taiwan products such as luggage bags, tags and accessories. The store is at areas A & B in Terminal 1 and at area C in Terminal 2. 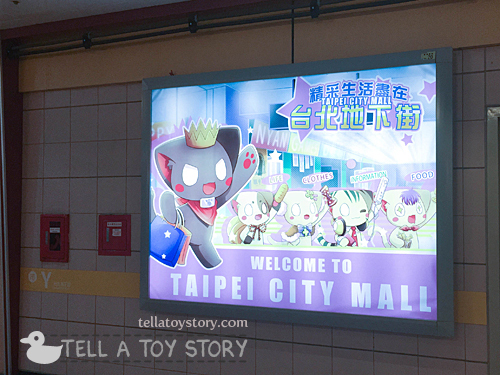 There are exclusive Taipei-themed Hello Kitty merchandise here. Great for last minute shopping before you catch your flight! Have fun shopping in Taipei! I’m more interested in shops with a huge and varied selection of toys (but not Toys R Us), but your webpage is a great place to start. Hi there, It’s nice to see such an informative site on where I can find someone also into toys. 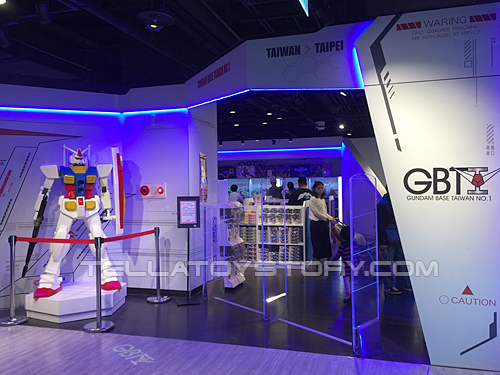 I’m actually heading for Taiwan and I’m interested to purchase a GX-71 Golion toy made by Bandai. 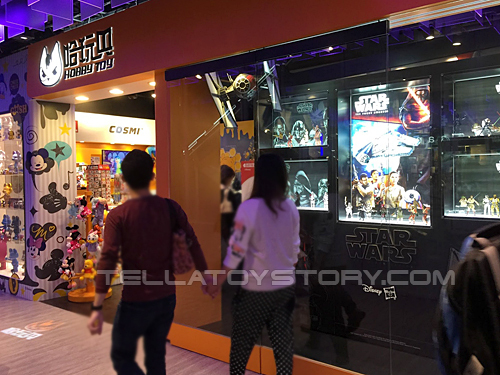 Would you know which toy store would have it? It would be a great help. Hi. Im looking for Momoko dolls to buy. Where can i look a big variety? 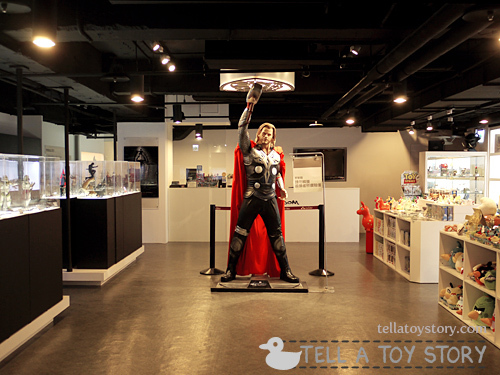 Hello, I was searching for toys in Ximending and I came across your article.